Elevated deck in Shelby Township, Washington Township, Oakland Township, Macomb Township. This is a brick paver elevated deck. The beams are larger, the joists are larger, the posts are larger. 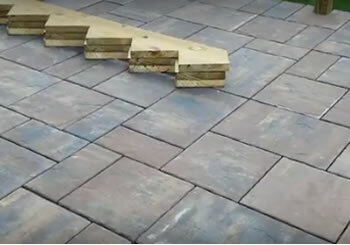 All the lumber is an engineered plan to hold the weight of brick pavers for your decking. Now, this is a maintenance-free. No maintenance at all with brick pavers, for your deck material on an elevated deck. I Want a FREE QUOTE on an Elevated / Raised Deck Design in the Shelby Township Area! For more information on an elevated deck in Shelby Township, Washington Township, Oakland Township, and Macomb Township give us a call at 586-752-2200.